Is there a way of creating a photogrametric point cloud from a set of densly distributed photographs of an object? I am trying to investigate if creating a 3D model (point cloud) of the outside of a building from UAV (Phantom 3 Pro) imagery would be a viable alternative to using a Terrestrial Laser Scanner (TLS) to create the point cloud. The UAV has a 12 megapixel camera and GPS. The aim is to fly the UAV around the building taking images at relatively close range and creating a point cloud from dense image matching software (hopefully Pix4D). The plan is to take the usual nadir and oblique images looking down at the building but also I will try to fly at low heights and take straight on and oblique photos looking up at the windows, eaves etc to try capture as much detail as possible. Pix4D did a project called Chillon Project where they did exactly what you are looking to do. Here is a link to their project on YouTube. Additionally they didn’t just rely on just the UAV to capture the imagery, but utilised terrestrial photos captured using hand held devices such as Go Pros and Smart Phones. The results are really cool! I've done this before with success using the Photosynth Toolkit (http://www.visual-experiments.com/demos/photosynthtoolkit/), except instead of a drone I was hanging my head out of a small plane taking pictures of the downtown area of a small town. You could also check out Visual SFM (http://ccwu.me/vsfm/); I haven't used it but it seems to be another tool to accomplish the same task. I recently got a drone as well, and intend to use both of these methodologies for the same project. I'll post some examples of the photosynth toolkit project when I get a chance. 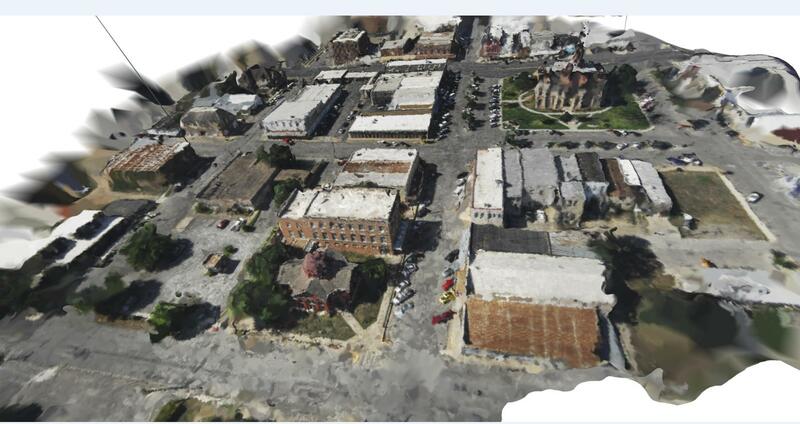 This is the point cloud data (with color information) resulting from a batch of aerial photos I took from the airplane. I clustered the images to focus on processing the point cloud for one block at a time, which is why the one block is so much more dense than the rest. Here's the same point cloud with a triangulated irregular network overlaid on top. It's not perfect, but it's a cool reconstruction. So, in answer to your question on whether using a UAV to generate point cloud data is a viable alternative to terrestrial laser scanner: yes, it is! Keep in mind that automated methodologies for stitching the photos together don't work well in high contrast lighting environments; If one side of your building is in sunlight while the other is in shade you may have trouble getting the photos to line up. The best time to take photos like that is when it is overcast. The clouds help diffuse sunlight making the lighting more even/consistent. If your lighting is good, you can take pictures at relatively close range to come up with a very detailed point cloud dataset. You can see from the TIN above that there's a line on the left side that looks like it goes from the ground up to space; that's an outlier that was not removed from the dataset. One thing you should look into is method of smoothing point cloud data/removing outliers, maybe using a nearest neighbor analysis. If you're taking very close up photos of the building, you may want to put targets on the building to help relate the photos to one another. If you use targets, make sure each one is unique so that photos don't get matched to the wrong location, and you should try to get 2/3 targets in each photo. If you have some targets on the ground, you can use GPS readings at each one to georeference your point cloud dataset, so that any measurements you take from the building would represent real-world measurements. If you want to look into georeferencing your point cloud data, check out Mark Willis' how-to guide (http://palentier.blogspot.com/2010/12/how-to-create-digital-elevation-model.html). It's an old blog, but the methodology is a good one. Peau Productions sells modified GoPro cameras with different lenses that have significantly less distortion than the lens that comes with the camera. They also sell the lenses themselves if you're up for modifying your camera on your own. I think a way to do this is VisualSFM to do the matching of the photos (the stronger the GPU the better) and creating a dense point cloud and MeshLab to create a textured triangulated model from the point cloud. -https://www.mapsmadeeasy.com/point_estimator you can use this to make a flight plan set variables to what you want make sure to pick inspire/phantom 3 as camera near the bottom, you can export this plan as kml for apm. or if you are more adept you can use the gis software of your choice to create a kml grid flight path for upload to litchi in the following step. -https://flylitchi.com/ for flight planning, upload your kml to mission hub from mapsmadeeasy make sure to change flight height, it is really slick and allows for awesome waypoint missions. -post mission use lightroom to correct distortion (same distortion as inspire 1) http://www.inspirepilots.com/threads/inspire-camera-lens-correction-profiles.1270/, if you skip this step your elevation models will have a kind of concave effect. -for sfm processing i would also recommend to try maps made easy as well they let you use gcp and use a point based system, free points at the beginning, and small jobs are free. Since the core of the question was the 3D reconstruction of a large object using a set of imagery acquired with the UAV, there are a few software products which greatly deal with the task. They are Pix4D, PixProcessing, Agisoft, CapturingReality, etc. All of them are perfectly capable of processing the set of photos in order to get a detailed 3D model of the object which provides point clouds and orthophotos for further calculations or simply an export of the file in any of the provided formats. The UAV equipped with the consumer grade GPS might require additional specification of the coordinate data if the further extremely accurate measurements need to be carried out. Therefore, to provide extra high accuracy, professional GPS device can be used, and that option allows highly accurate georeferencing of the reconstructed model if the additional coordinate data is given to avoid error occurring due to the global shift. On the other hand, if the geotagging and georeferencing is optional and not the target of the project, Phantom's GPS data gives enough information to proceed with. To sum up, the named above software is a significant alternative for TLS. Not the answer you're looking for? Browse other questions tagged georeferencing photogrammetry 3d-model unmanned-aerial-vehicle point-cloud or ask your own question. What software to use for making digital elevation models from UAV aerial imagery? 3D to 2D from point cloud using a georeferenced orthophoto? Georeferencing terrestrial LiDAR point cloud? Why ground model from point cloud in Global Mapper is inaccurate? 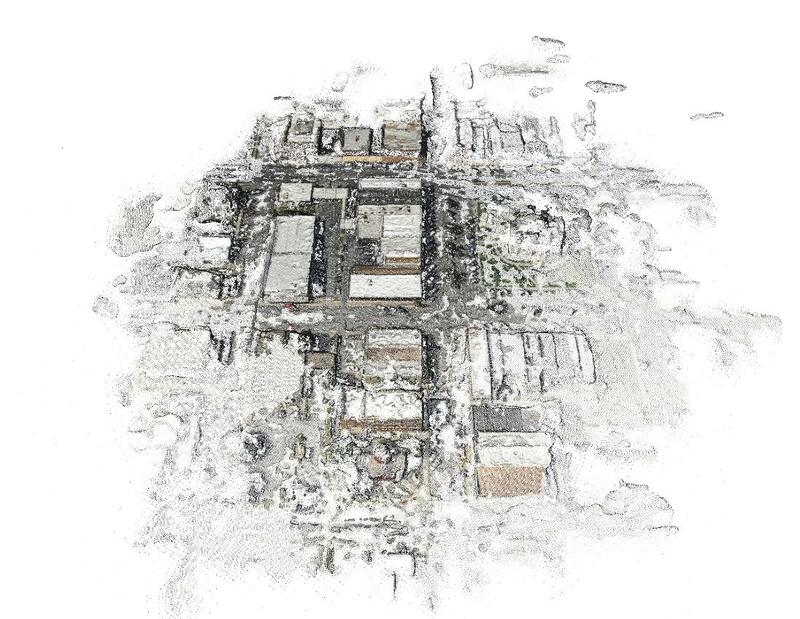 How to georeference point cloud data that was no spatial information?